When you decide to use SAP CRM to calculate taxes, there is a need for it to understand about the taxes that needs to be applied for different business partners, for different products or services, and at what specific rates. It doesn’t matter which tool you use for calculating the taxes – the condition technique or Transaction Tax Engine (TTE) – you need to clearly define the taxes that your channel partners will have to bear. In SAP CRM, taxes like exercise duties or VAT (value-added tax) on commodities like cigarettes, are also referred to as ‘tax types’. The ‘tax groups’ can be different like, VAT at ‘0%’, ‘7.5%’, and ‘15%’. 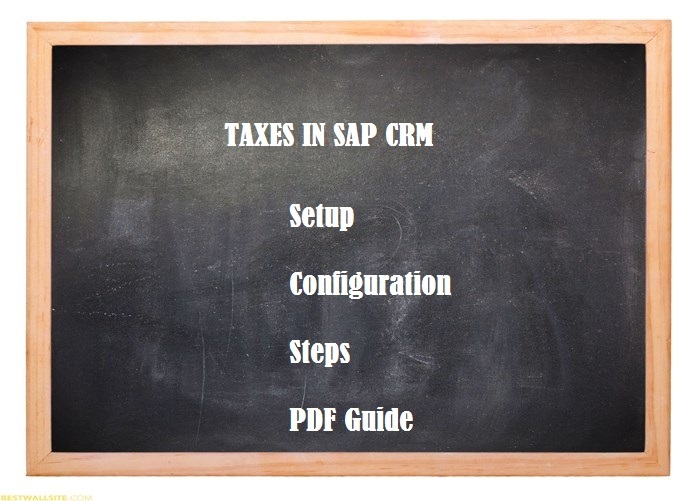 How to setup SAP CRM for implementing TTE? Setting up SAP CRM for implementing TTE is easy. For this, first, you need to have the cross application components customized. First, you need to select ‘IMG’ under ‘SPRO’. Once there, select ‘Cross-Application Components’ followed by ‘Transaction Tax Engine’. Then, under the ‘Tax Maintenance Settings’ option, click the ‘Tax Determination and Calculation’. Finally, click the ‘Define Tax Event Determination’ option. Whether it is service or sales processing, determining taxes is an important step. In a vast number of cases in which the back end integration of SAP ECC (SAP ERP Central Component) is required, taxes involved for services are defined within SAP CRM. However, for sales processes, like sales taxes, these are defined using SAP ECC and then transferred to SAP CRM. Therefore, a SAP CRM technical user has to be comfortable in using tax settings in both SAP CRM and SAP ECC. You need to take into account various types of taxes that need to be defined based on the legal requirements of the country it will be implemented. You also need to find out whether they need to be created on the SAP CRM side or the SAP ECC side. It is important to decide on these matters for a seamless implementation of service or sales process. Business rules are established such that no taxes are considered for export sales. Similarly, half taxes and full taxes should be considered based on the type of product and customer. An input document is compiled by TTE. From this document, the derivation of Tax event takes place. In this step, you need to use TTE for the tax event for finding out the tax type and deriving applicable tax calculation. The tax calculation amount is then received by TTE from SPE. The output document is then compiled by the TTE along with the results of tax determination like – tax calculation amount, tax calculation procedure, and tax type.